This past month, I have been busy healing and getting back to training. I wore the boot for about 10 days while I wasn’t swimming or water running. Once I was released from the dreaded boot, I started riding my bike on the trainer and after several days was able to start riding outside again. Training was busier than ever while I was rehabbing my shin. At first, when my training schedule had a run, I water ran for that amount of time. Once I was able to start biking again, I biked everyday in addition to my regular swim workouts. Running is much less time consuming than getting to the pool to water run or dealing with the bike, so my recovery time was pretty hectic. Finally, after 18 days, I was allowed to run one mile. It was on the same day that Mike and I were supposed to run a small half marathon about an hour north of here. It was a gorgeous fall morning, so Mike went to the race and I headed to a soft trail to do my run. When I got back to the car after my 10 minutes of glory, I was relieved and excited. My shin didn’t hurt at all and I felt like a huge weight had been lifted off of me. I checked my phone before I started the short drive home and noticed that Mike left a message just a few minutes before. This is weird because that would mean he was calling me when he should be half way through his race. Not good. He left me a voice mail message saying that he had been having a great race but fell and hurt his ankle. I called him back and after some discussion, we decided to meet up at home and then drive to the orthopedic clinic together. 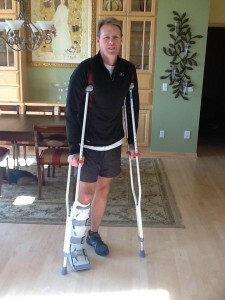 No sooner had I made it out of the boot and back to running and now Mike is out with a broken leg. His break occurred 7 weeks before Ironman Florida. The earliest healing time would be 6 weeks, so it’s going to be close. They will do an x-ray next week and that will give us a better idea of the rate of healing. The good thing is that when a bone is healed, it’s healed. So if it’s done healing in 6 weeks than doing the Ironman won’t hurt it, unlike a ligament which would have scar tissue and would be easily re-injured. Right now he’s being patient and waiting for the x-ray. If that goes well, then he will get to swim and start spinning on the bike. With now only 5 weeks until the race, hopefully he can still get some time in the pool and out on the bike before race day. He’s run 20 marathons and done Ironman 3 times, so he has a great base of fitness to go into the race even without any more running before race day. It isn’t ideal, but given how much training has already gone into this event, it would be great if he could at least get out there and enjoy the day. So we have traded places. I’m back to training and after slowly adding running miles back, I’m caught up to my regular schedule and feeling pretty good. Now that it’s getting so close to the race, the training days are crazy long. Weekdays have 2-3 hours of training each day and the weekends are very long. I know what it feels like to be out with an injury while everyone else is out doing there thing, so I won’t complain about the long days. There are just 3 more crazy weekends and then 2 weekends of taper before November 3rd. Hopefully Mike will be back at it soon and we’ll be ready for the big day- it wouldn’t be the same without my guy out on the course with me! I am very sorry for Mike but he is an athlete and his recover will be very fast. In this situation the most important thing is “to take his time”; unfortunately I have a big experience in fractures. Glad you are back to run. All the best to Mike for a speedy recovery! Sending positive thoughts and good wishes. I am glad to hear you are getting back to your training, Beth. Take care, and I hope it continues to go smoothly as you build up your miles! I was so sorry to hear about Mike, but you are right. He’s got a good base and hopefully will be right there with you for IM FL. I am very glad to hear that you are back out there, though. You will do GREAT! OH NO! Running Marrieds don’t do well when one is injured and the other strong…yikes! We are at the tail end of that story and although I can report a happy ending, it wasn’t easy on my husband! He didn’t get to run Chicago and was SO unhappy but still an awesome spectator! I hope he heals up QUICKLY…like miraculously! What race are you running on the 3rd? I could figure it out! I’m happy you’re back on the road!